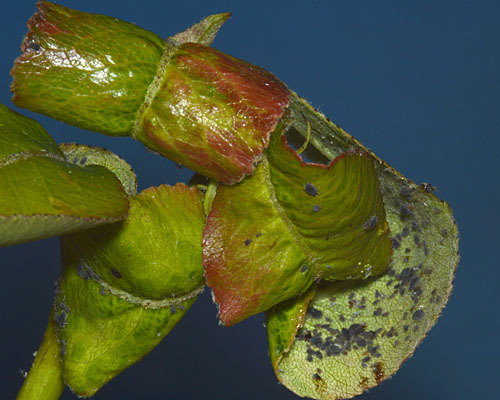 In spring Melanaphis pyraria roll the leaves of pear, the primary host, transversely or diagonal to the mid-rib (see first picture below). The pseudogall may become yellowed or reddened. The dorsal abdomen of the adult aptera is dark reddish brown and has a solid dark sclerotic shield (see second picture below). The hairs on the antenna and dorsal body are minute, less than half the diameter of the third antennal segment. The siphunculi are dark, about twice their basal width and shorter than the cauda. The body length of Melanaphis pyraria is 1.3-2.1 mm. 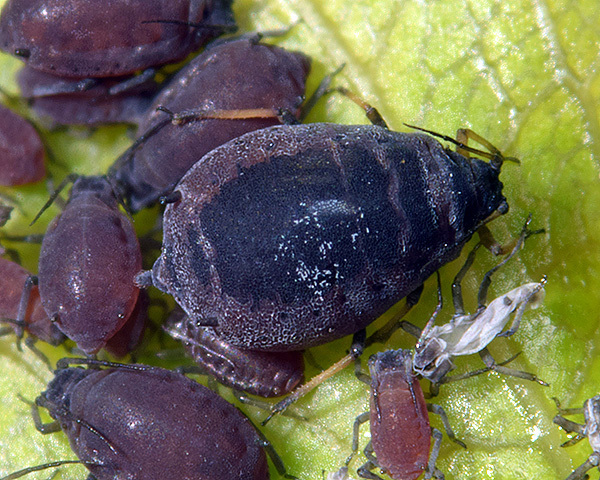 The alate of Melanaphis pyraria (see third picture above) has a brown abdomen with the dark dorsal shield reduced to a series of transverse dark dorsal bands across the abdominal tergites. The head and prothorax are dark sclerotic. The micrographs below show an apterous adult Melanaphis pyraria, dorsal and ventral, in alcohol. Melanaphis pyraria host alternates from its primary host pear (Pyrus) to its secondary hosts grasses (including Arrhenatherum, Poa, Holcus and Triticum). On their primary host Melanaphis pyraria may be attended by ants. On the secondary host the appearance of Melanaphis pyraria differs according to the particular genus of grass colonized - reddish purple on Arrhenatherum, and yellowish on Poa and Triticum. 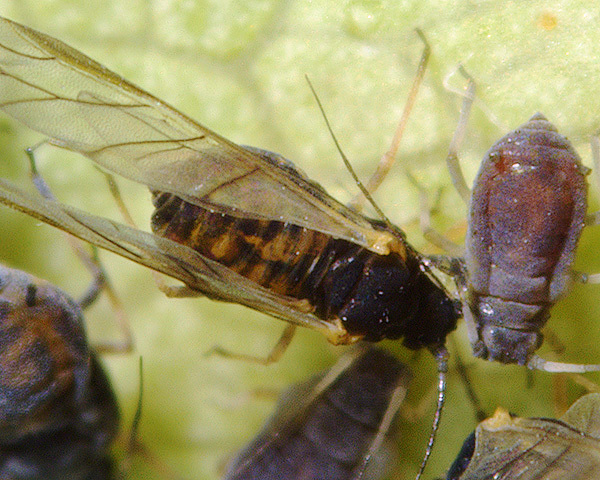 The pear-grass aphid is widely distributed in Europe, as well as the Mediterranean region, the Middle East and the Caucasus. 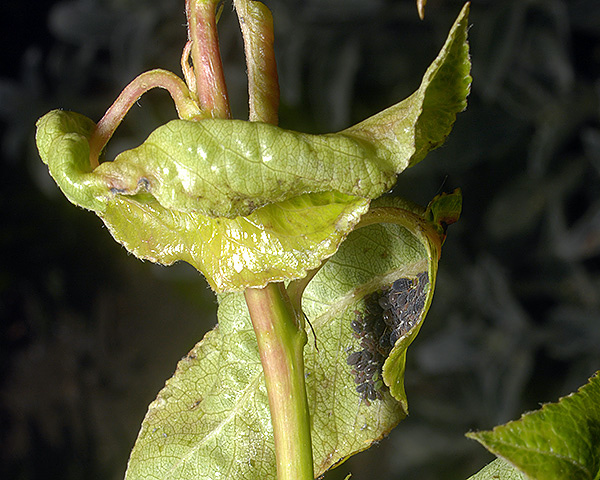 Pear-grass aphids do not produce a true gall on pear (in other words there is no enlargement and/or proliferation of host cells), but the pseudogall (leaf roll) can be very conspicuous on pear trees in spring even without the typical red discolouration (see picture below). 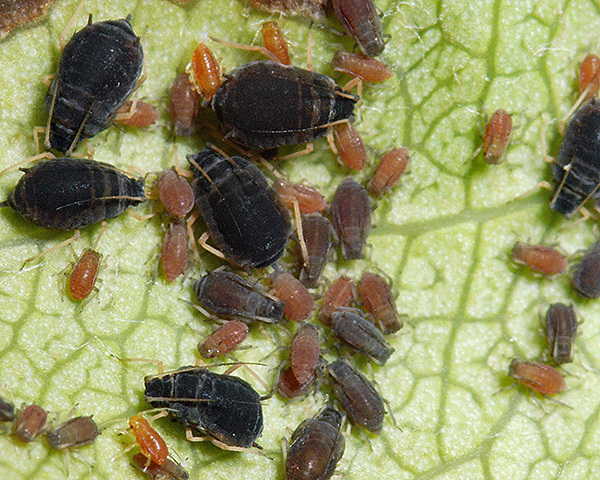 The youngest nymphs are bright orange turning to red-brown as they mature (see picture below). Melanaphis pyraria has been recorded from 3 Pyrus species (Pyrus amygdaliformis, Pyrus communis, Pyrus korshinskyi). Blackman & Eastop list 53 species of aphid as feeding on common Pear (Pyrus communis) worldwide, and provide formal identification keys. 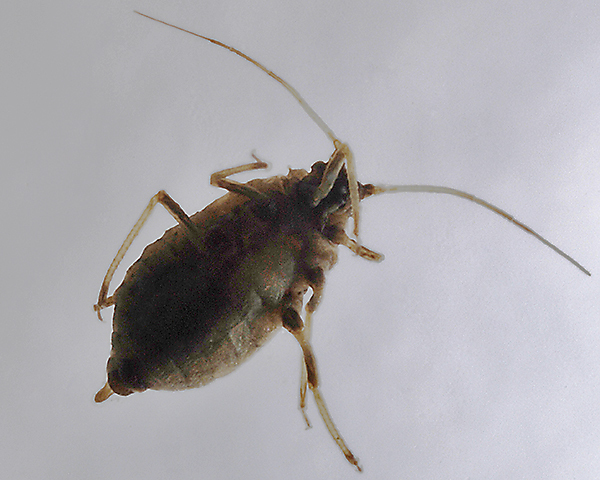 Of those aphid species, Baker (2015) lists 30 as occurring in Britain: Anuraphis catonii, Anuraphis farfarae, Anuraphis subterranea, Aphis craccivora, Aphis fabae, Aphis gossypii, Aphis pomi, Aphis solanella, Aphis spiraecola, Aulacorthum solani, Brachycaudus cardui, Brachycaudus helichrysi, Brachycaudus persicae, Dysaphis plantaginea, Dysaphis pyri, Eriosoma americana, Eriosoma flavum, Eriosoma lanigerum, Eriosoma lanuginosum, Eriosoma pyricola, Macrosiphum euphorbiae, Macrosiphum rosae, Melanaphis pyraria, Myzus ornatus, Myzus persicae, Nearctaphis bakeri, Ovatus crataegarius, Ovatus insitus, Rhopalosiphum oxyacanthae and Rhopalosiphum padi. Melanaphis pyraria has been described from at least one Arrhenatherum species (presumably Arrhenatherum elatius). Aside from which, Blackman & Eastop list 19 species of aphid as feeding on false oat-grass, tall oat-grass, tall meadow oat, onion couch and tuber oat-grass, (Arrhenatherum elatius) worldwide, and provide formal identification keys. 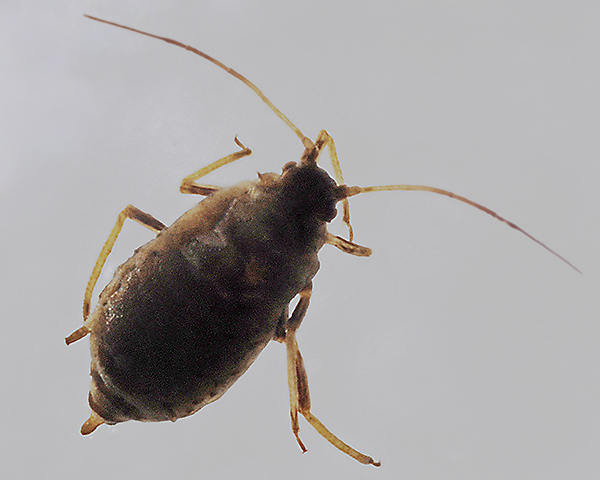 Of those 20 aphid species, Baker (2015) lists 17 as occurring in Britain: Anoecia furcata, Anoecia vagans, Atheroides hirtellus, Forda formicaria, Geoica utricularia, Hyalopteroides humilis, Melanaphis pyraria, Metopolophium albidum, Metopolophium dirhodum, Metopolophium fasciatum, Rhopalosiphum padi, Sipha elegans, Sipha glyceriae, Sipha maydis, Sitobion avenae, Sitobion fragariae and Tetraneura ulmi. Melanaphis pyraria has been described from 2 Poa species (Poa annua, Poa bulbosa). Melanaphis pyraria has been recorded on 1 Triticum species (Triticum dicoccoides). Blackman & Eastop list 2 species of aphid as feeding on emmer wheat (Triticum dicoccoides) worldwide. Of those aphid species, Baker (2015) lists both as occurring in Britain: Melanaphis pyraria and Sitobion fragariae. Special thanks to Giuseppe Cocuzza for correcting our original misidentification of this species.